Here is a story by Andrew Martin of his volunteer work with an amazing Christian non-profit organization called Kids Around the World. Kids Around the World helps children and families who have been affected by war, poverty, illness, and natural disasters. They provide nutritious meals, teach bible studies to education workers, and build playgrounds for the children to ensure their physical, emotional, spiritual and cognitive development. They give children the opportunity to “just be kids” instead of victims of the unfortunate circumstances they’re faced with. I’ve personally had the honor of volunteering with this organization locally and it was an experience I’ll always cherish. 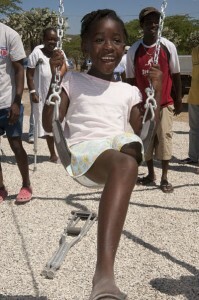 Andrew’s volunteer work took place in Haiti. Please enjoy this inspirational story of his volunteer work abroad for the children of Haiti. This is the perfect example of how volunteering abroad can change lives not just today, but for years to come. “This is life-changing!” reflected one of the volunteers after this morning’s playground dedication ceremony in Bonneau, Haiti. That’s exactly how we all felt. 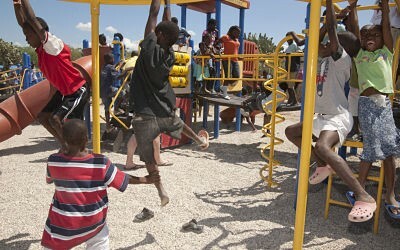 Building a playground for the children of Haiti was not only life changing for them, but for us as well. But, let’s back up briefly, as the day before the dedication we met with some unexpected challenges! All that was left to do the day before the dedication ceremony was to finish pouring concrete where needed, building the wheel-chair ramp, and carrying over sand to cover the playground surface. Sounds simple enough right? Well, first try to imagine the scene. You pull up to the side of a dirt and rocky road and look down, about 60 feet below and 100 yards out. That’s where the playground will be located. The only way to get there is down a steep dirt path past one leveled out area (that was dug out by hand) for the church that will be built there soon. You then continue further down the hill to the bottom where you encounter at least 15 large sand piles spread out over half of a football field. Only then do you finally get to the playground. Still, things didn’t seem too bad. There were a number of sand piles within about 30 feet of the playground and we had two wheelbarrows and several buckets. We’d simply carry that sand over to cover the playground’s surface. However, as we began filling the wheelbarrows with the nearby sand, we were quickly stopped by the local villagers. They explained that the only sand we could use was the sand from the pile that was the furthest away from the playground, about 50 yards away! Well that wasn’t going to stop our progress. So for most of the day we carried bucket after bucket back and forth until the whole surface was covered by about 2:30 PM. During this time, others in our team continued their Vacation Bible School with the large group of children that showed up every day. Today, they heard the lesson about Jesus welcoming the children and were told how our Lord welcomes each of them if they will only come to Him in faith. After a group prayer the children went back to playing games and filling the air with laughter. 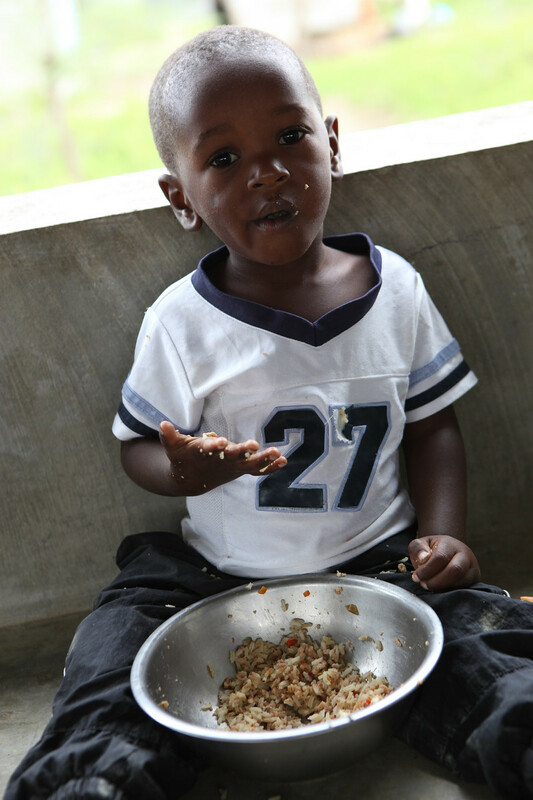 They even taught us the Haitian version of the hot potato – instead of passing the “hot potato” each child slapped the palm of the child to their left as they sat in a circle singing a local children’s song. We were laughing right along with them as one by one another child was eliminated and those who remained celebrated their little victory. We returned to the Northwest Haiti Christian Mission (NWHCM) campus exhausted but so excited because tomorrow was dedication day! After breakfast we helped get the special needs children from the Miriam Center onto the truck for the trip out to the playground. They each sat on the lap of a team member and laughed their way to Bonneau as the wind blew in their faces and they bounced up with each bump in the road. It was a great preparation for the joy they were about to experience. When we arrived at the site a few of the volunteers ran down the hill ahead of the children to decorate the playground and attach the final swings. We were followed by the many children and parents from Bonneau who had become a fixture at the site over the last 3 days. We saw many of the local men who worked side by side with us to help build the playground. We were proud to now call them friends. The dedication ceremony began with a speech by Shannon Neel, whose Kimmy’s House Foundation (named after her daughter) had funded the playground in honor of her late father. She beautifully described the love that brought this playground to Bonneau and its children. I then said a few words and Shannon’s brother, Brandon Kirby, finished with a prayer for the children. It was finally time to cut the ribbon! Shannon, assisted by her brother and son, had the honors. Our team then helped the Miriam Center’s special needs children into the playground first as the other local children waited patiently (as patiently as they could!). Once each of the special needs children were able to slide down their chosen slide at least once the local children were “freed” to have at it. We instructed the team members to guard the Miriam kids and make sure they weren’t trampled on by the local kids. We never expected one of the mothers to pose the biggest threat! She had been watching the children on the swings while the others stood in an orderly line awaiting their turn. But as soon as one boy got off the swing this mom came running in, pushed the next boy out the way, and jumped on the swing! The other adults started laughing until about 5 swings in when she leaned too far back and slid almost completely off the swing! The nearby adults caught her just before she fell into the sand. Everyone was laughing hysterically, including her. I guess a playground can turn adults into kids too! We all continued watching, smiling and laughing, snapping photo after photo, and wiping tears. The pain of sore muscles and sunburned skin vanished with the joy of seeing the children playing with endless energy and laughter. We had such a sense of accomplishment and pride. I must say – job well done team!! Thank you Kimmy’s House and NWHCM for allowing us to partner with you. And thanks to our team for being such an instrumental part of this wonderful project. Your hard work will allow these and many future generations of children to do what they do best – just be kids! Hi! I work for Haiti Bible Mission as their sponsorship coordinator. 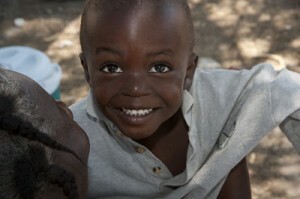 I oversee our 160 students at our rural countryside school in Jeremie, Haiti. We are trying to build a playground there, as the kids have never had anything like that! I would love to connect and hear more about your program! I look forward to connecting!